Abstract : This paper describes a probabilistic generative model and its associated algorithm to jointly register multiple point sets. The vast majority of state-of-the-art registration techniques select one of the sets as the ''model" and perform pairwise alignments between the other sets and this set. The main drawback of this mode of operation is that there is no guarantee that the model-set is free of noise and outliers, which contaminates the estimation of the registration parameters. 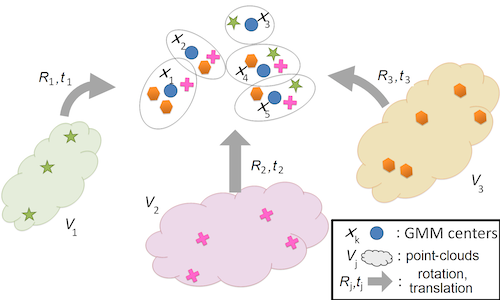 Unlike previous work, the proposed method treats all the point sets on an equal footing: they are realizations of a Gaussian mixture (GMM) and the registration is cast into a clustering problem. We formally derive an EM algorithm that estimates both the GMM parameters and the rotations and translations that map each individual set onto the ''central" model. The mixture means play the role of the registered set of points while the variances provide rich information about the quality of the registration. We thoroughly validate the proposed method with challenging datasets, we compare it with several state-of-the-art methods, and we show its potential for fusing real depth data.